At the request of the Secretary of Energy, the Energy Information Administration (EIA), an independent agency of the U.S. Department of Energy, evaluated the energy-related subsidies that the federal government provided in fiscal year 2016, updating a study that it did for fiscal years 2013 and 2010. Federal subsidies to support non-fossil fuels (renewable energy and nuclear power) in fiscal year 2016 totaled $7.047 billion (in 2016 dollars), while those for fossil fuels totaled $489 million—higher by over a factor of 14, despite much higher production by fossil fuel producers. The EIA noted that those subsidies do not include state and local subsidies, mandates, or incentives that in many cases are quite substantial, especially for renewable energy. For example, about three fifths of the states have “renewable portfolio standards” which are actually mandated levels of renewable energy production. Many states also waive tax payments specifically for renewable energy or offer other sweeteners for renewable energy production. These incentives are provided due to years of lobbying by renewable energy interests. Readers can see just exactly what their state offers renewable energy providers, and what it may be costing them, by reviewing this site. Of the non-fossil fuel share of production, nuclear power contributed 10 percent, followed by biomass at 5.9 percent, hydroelectric at 2.9 percent, wind at 2.4 percent, solar at 0.6 percent, and geothermal at 0.2 percent. Biofuel subsidies totaled $2.8 billion in FY 2016 while wind subsidies totaled $1.3 billion and solar subsidies totaled $2.2 billion. Both wind and solar continue to be eligible for tax credits—production tax credit for wind and the investment tax credit for solar. In FY 2016, tax expenditures accounted for 80 percent of total renewable energy subsidies. In FY 2016, federal subsidies and support for fossil fuels totaled $489 million. In FY 2016, certain tax provisions related to oil and natural gas yielded positive revenue flow for the government, resulting in a negative net subsidy of $773 million for oil and natural gas, based on estimates from the U.S. Department of Treasury. Federal subsidies and support for coal totaled $1.26 billion in FY 2016. 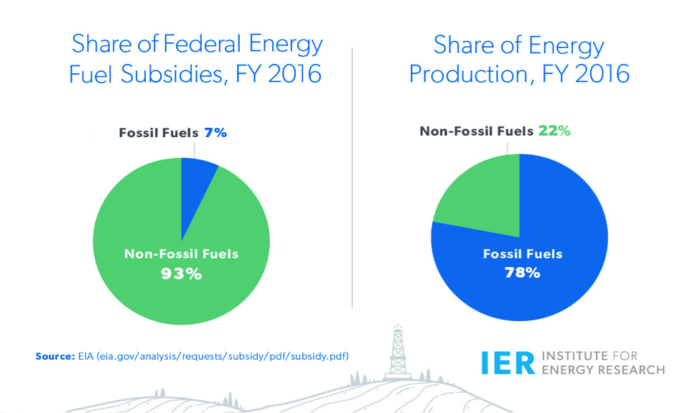 Fossil fuels provide the yeoman share of U.S. energy production, but non-fossil fuels, particularly renewable energy, receive the major share of federal subsidies and support. 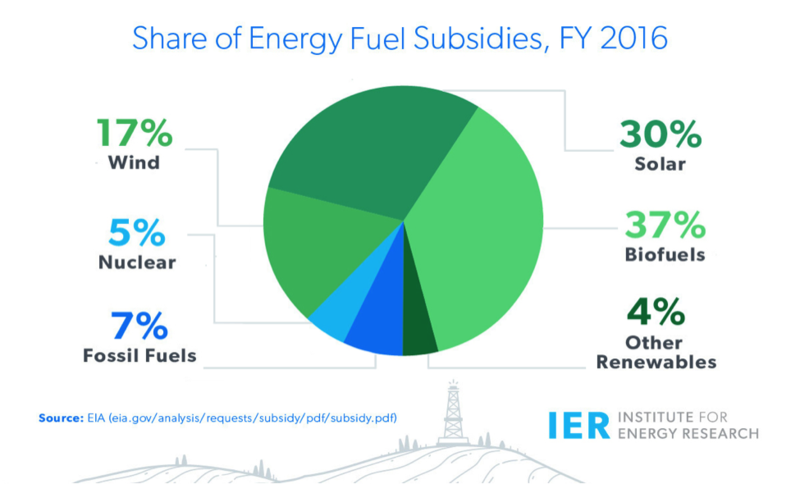 For more information on EIA’s subsidy report see this related blog.